For patients who have grown tired of the constant maintenance of shaving and waxing, Dr. David Zweiback can remove excess hair with a series of laser treatments, creating a permanent reduction in hair growth. Over the course of several treatments, patients can reduce unwanted hair on the legs, back, neck, face, or bikini area. To learn more about laser hair removal offered at our Philadelphia, PA-area practice, contact us today. Laser hair removal can provide smooth skin and boosted confidence. Traditionally, the ideal candidates for laser hair removal are patients with light skin and dark hair, but advancements in technology have made it possible to treat patients with light skin and light hair, and some patients with darker skin. It is important to remember that results will vary from patient to patient. Although it is a long-term hair removal method, it is not permanent, and you will likely see regrowth within a few months to a year. The new growth will likely be lighter in color and finer in texture. 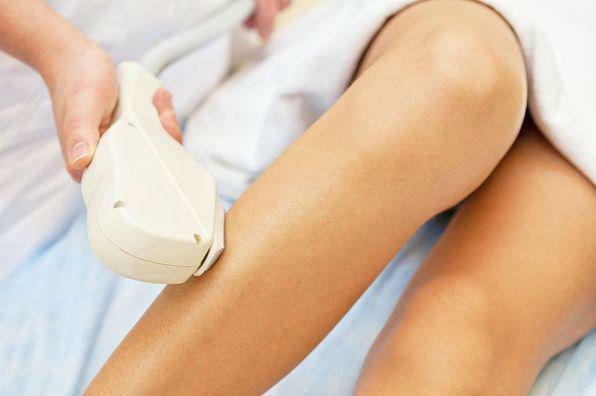 During your initial consultation with Dr. Zweiback, he will conduct a careful analysis to determine if you are a candidate for laser hair removal. If he determines that the treatment is right for you, he will evaluate the areas you wish to treat. Prior to your treatment, a numbing gel may be applied to the skin to reduce any discomfort. The numbing gel may take 30 minutes or more to take effect. You will be given protective goggles to wear during the treatment. The skin at the treatment area will be held taut by one of Dr. Zweiback’s assistants as he applies the laser. Most patients feel some discomfort during this process, akin to the feeling of a snapped rubber band. The hair is essentially vaporized by the laser, resulting in small puffs of smoke. Most patients will require multiple treatments, because the laser targets hairs in different stages of the growth cycle. The duration of individual treatments will depend on the size of the treatment area. After each laser hair removal treatment, you will notice some redness and swelling in the treatment area. However, you should be able to return to your normal activities immediately. It is recommended that you avoid sun exposure (outdoor and indoor) and always wear sunscreen. It is important to follow your after-care instructions for the best results. Most patients will have a treatment session every four to six weeks until all visible hair has been effectively removed. If you have unwanted hair and are ready to stop spending so much time shaving and waxing, laser hair removal may be an ideal treatment solution. Contact our office today to schedule your initial consultation. Dr. Zweiback can help determine if this treatment is the right way to help you achieve the results you want.